Wow - this has been a hard one to find! I'd like some new PJs. I get cold way too easily, and buttons all the way down the shirt drive me crazy. I usually sleep in PJ pants and a sweatshirt, but would love something cuter. Aren't these neat? 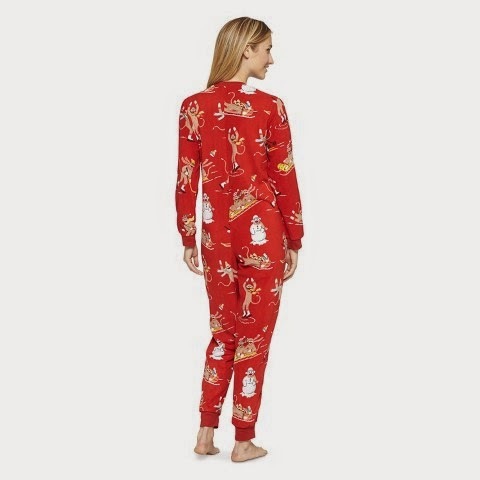 They're the Nick and Nora Women's Union Suit from Target. This is the Downhill Monkeys pattern, but the Aqua/Penguin would be nice too. Unfortunately, of all the measurements they give for determining size, they don't include a height, which to my mind would be pretty important. I'm 5'8", so I'm guessing I'd probably want a medium, based on everything else. I'd considered a traditional footie PJ, but I usually take my socks off to sleep. Having my feet not only covered, but with seams on the ends of my toes, doesn't sound very appealing. Besides, how would my new slippers fit on over the footies of new PJs?